Saleae is a small instrument company based out of San Francisco comprised of bright young folks who make me wistfully think over the decades since my friends and I were the young bucks. It is inspiring to see a new generation inventing complex electronic products. A couple of years ago I reviewed their Logic 16, a 100 MHz 16-channel USB-based logic analyzer. That product doesn't seem to exist anymore. Instead, the company offers inexpensive 4- and 8-channel devices, and recently added 500 Msps 8- and 16-channel instruments. They sent me a Logic Pro 8, which is in a stunning solid-metal case about 2"x2"x3/8". It's spare, in the way of an iPhone. Unlike most USB instruments the thing is beautiful, solid, and even comes in a zip-up traveling case, though is so small a shirt pocket could hold it plus the requisite pocket protector. The iPhone 6 reputedly bends if stored in a rear pocket; this device most definitely does not. I called it a logic analyzer but it is more than that. It occupies an interesting hybrid space between logic analyzer, oscilloscope, and mixed-signal scope (MSO). The MSO is one of the more important tools for embedded developers as it shows both analog and digital information at the same time. An MSO critically offers the ability to trigger from digital and/or analog channels so you can see their interaction in real-time. The Logic Pro 8 doesn't have any analog triggering modes so isn't quite an MSO. However, it can gather so much data (limited by the memory in your host computer) that in most cases this will not be much of a limitation. Functionally the unit is like a logic analyzer: you command an acquisition, which is then displayed. It's not like a scope that repetitively and constantly updates the display. So I would not use this as a scope substitute; think of the analog as a way to see what is going on in that domain while triggering on digital data. Each channel can accept digital or analog data - or both at the same time. Though rated at 500 Msps that's only if one is using four or fewer digital channels. Enable more or any analog collection and the rate drops off. Their web site has an interactive tool that lets one see what rates are possible depending on the combination of channels used. The tool is nice but I'd sure like a clearly-spelled out set of specs instead of having to puzzle out the product's behavior by trying different combinations. The web site does say that the fastest digital signal allowed is 100 MHz, lower than the Nyquist cutoff, but probably realistic given the wire probes. Analog channels sample at 50 MHz or lower, again depending on the number of channels at play, with a -3 dB point at 5 MHz. I really like the 12 bit A/Ds and +/- 10V input range. I found voltage readings accurate to about 0.1%, an astonishing number for a scope. USB 3.0 is supported. The channel tool on the web site lets you know how long your host computer can record data in real time; generally it's minutes to hours. PC, Mac and Linux UIs are available. Too few tools support all of these hosts. I connected it to my Mac Air, as the Logic Pro's tiny form factor just screamed to be paired with an ultra-portable. A quick measurement shows the instrument draws about 310 mA from the host's USB port. A Mac Air runs about 9 hours on a charge. With the Logic Pro connected the battery level went from 100% to 55% in three hours. That's a lot of portability. Matter of fact, you could set up a development lab on an airplane's tray! I suspect the flight attendants wouldn't be too thrilled. The unit will trigger on a rising or falling edge, or on a pulse of a settable positive or negative duration. Width can be adjust to as low as a range from 1 to 2 ns. I can't generate a pulse like that, but ran a 24 ns pulse in, telling it to trigger on one under 20 ns wide. No trigger, as expected. Broadening that to 30 ns the device captured the data, and the cursors showed it was indeed 24 ns. Pretty impressive for a small unit like this. You can set up any one channel to be an edge or pulse-width trigger; the others then qualify the condition by logic state (0s, 1s, or don't cares). 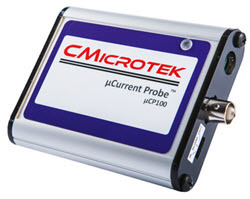 The unit has the usual features found in these USB instruments: configurable pre-trigger buffer (hugely important), a variety of protocol analyzers, and cursors. The cursors are simple to use: click on the icon representing the one you want, then click on the spot in the trace where you'd like it set. I had to repress an urge to drag the cursors around in the data; that doesn't work, though would be a nice feature. Just hovering over the channel 1 waveform pops up the measurements shown. Other measurements can be enabled as well. I highlighted two features in the picture: the small red box surrounds the icon one uses to set trigger data for each channel. The green circle pops up some channel configuration options. One sets the vertical size of the channel's display; for the analog I blew it up to 4 times the size of the others. Fast? You betcha. This might be the fastest USB instrument UI I've used. Simple, too. Remember that this was evaluated on a Mac Air, which is not a particularly speedy machine. The grabber clips are included. And the wire probes are labelled at the working ends. Yes, the wires follow the resistor color code, but it sure is nice to have positive labels. Is that black lead a ground or probe 0? The labels remove all confusion. At $479 for the 8 channel model and $599 for 16 these instruments are priced above the cheap devices that have come to market in recent years, but they offer more performance than most. The Logic Pros, both price and feature-wise, intrude into the lower-end segment of the market that Picoscope has dominated. It's impossible to make a comparison between competing units since the feature sets vary so widely; as always, you'll have to make a decision based on your needs. Do note that Saleae has other, lower-performance units, for much lower prices. For more info see https://www.saleae.com/. Do you use these USB instruments? How do you like them?